This OVA takes place in between episodes 8 and 9 of the first season of Hakuouki. Yukimura Chizuru goes on a reconnaissance mission in Shimabara as a geiko for the Shinsengumi. Each episode unfolds the events of the days leading up to, during, and after the operation. It intermittently reveals each captain's involvement as well as that of a few demons in the affair. 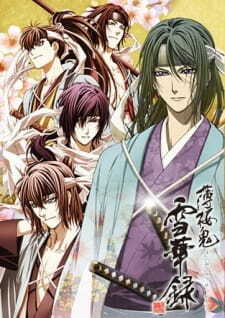 Each individual episode primarily focuses from the third person perspectives of: Okita Souji, Saito Hajime, Harada Sanosuke, Toudou Heisuke, Hijikata Toshizo, and Kazama Chikage. Well first i thought this was yeah "Fan service" of course- but after seeing these valuable episodes i'm pretty much satisfied both with the main season and this. It simply added the required finishing touch. This is the 6 piece OVA of the franchise Hakuouki which is mainly comprised of tragedy. And this could be the only episodes which clings to the emotional side of the characters since in the main season focuses solely on battle and sadness. Story:Well as you all might know Hijikata Toshizo the Oni Lieutenant and Okita Souji as simply saying the "Shinsengumi" it revolves around them, and a girl is thrown at the lions den to see how it would go. Well as much as i want to put it bluntly, these lions are very much dignified and refined men than well most of the "Lions" i have ever seen. Sound: Average Opening and Ending- since it's an OVA it's al right i guess. The voice dubbing is admirable. Same soundtracks used in the anime is present here. Characters: This is the highlight. Whilst the main season went like a pistol-very fast not giving many characters their screen time) This gave a lot of consideration to acknowledge their feelings to the "Otome" It also shows most of the sides we should have seen in characters- which they could have thrown in the first season- but who am i to question the budget of the directors for that? Enjoyment: Thoroughly enjoyed- pasted a smile on my face- this was light hearted/deep and slow but there could be sadness whisked in their that you'd see if you dwell deep into the episode. Overall: Remember it's fan service - no questions asked. But for a fan it was extremely enjoyable to see their favourite characters once emotionally unleashed. I gave it an 8- because the creators did a sound job focusing on one scene of the anime and then creating various scenarios out of it. I almost didn't watch this! But I am so glad that I did. This really rounds off the other two seasons of Hakuouki. I just wish Chizuru was left out. She is useless. Uselesssssss! Also - SAITOU HAJIME IS LOVE. <3 <3 <3 Although his feelings for Chizuru made me annoyed, I was able to let it go - it IS a reverse harem of sorts so as the only female heroine it is a necessary part of the plot for all these amazing men to dote on her (it would not make sense if that weren't the case). I still don't understand why the female protagonist has to be like that. I thought maybe some of her supposedly 'demonic' powers would be displayed but no such luck! Well, I'm done ranting. It was a good watch this one. Ah, the OVAs and the main series were pretty good in my opinion, the characters were fairly well developed and stayed within their themes quite well, however the main character was extremely boring, nothing special in the way of protagonists. I've seen her character SO many times, so that was a little disappointing. The art style isn't quite the way that I like it, but considering it is from around 2007 that is to be expected. One thing that I absolutely could not stand was (SPOILER ALERT) the fact that EVERY SINGLE GUY DIED. Literally, all of them except Shirunai and Kyuuju. T^T Overall though, it was decent. I mean, I liked it enough to watch all the episodes (even the ones from the main series, first and second season) all in one day, lol. Honestly I'm a big fan of the Hakuouki series as a whole, but out of all of the various OVA's, Movies, Series, etc. I believe this is my favorite little mini-series. If you haven't watched Hakuouki & Hakuouki Hekketsuroku than it's important to watch them first in order to understand the more intricate details about the overall story. I love this because it shows us the boys a bit more and how their relationship with Chizuru is, and why she's important to them (the game that the anime is based on is an otome one, afterall!) and it also gives us more light-hearteded enjoyment as well, since the main series is a bit heavy. Plus, we get to see how these characters are not flat copies of one another, or just trope-y otome love interests, they are interesting, well rounded individuals that all have their own flaws and strengths. I think it's a very good addition to the collection of already great works for this series.